I get to spend a large amount of my time hanging out in schools where people care really deeply about building inclusive environments where everyone feels safe. Just this week I got to spend a day learning from some committed educators at the high school I graduated from, educators who are going above and beyond to serve traditionally marginalized students. Most of the time when I’m working with a school, though, there is a laundry list of problems laid out by students, staff, parents, and administrators: cyberbullying, teachers feeling bullied by administration, students feeling bullied by teachers, students treating other students like crap, students feeling like no one cares for them in the building, etc. Even if it’s a minority of voices, I can always find people to talk about the trials, the challenges, and the difficult stuff that the community is facing. Thus, when I was asked to work with Columbine High School in Littleton, CO, I was pretty sure what I would encounter. What I wasn’t sure about was how Columbine’s history would impact how inclusive it is today. I had all sorts of preconceived notions about the community based in the media frenzy surrounding the community since the shootings there in 1999, but what would the community actually be like? Columbine is proof that when people dedicate themselves to inclusion and building safe educational environments, individuals can have a powerful impact. In the case of Columbine, this spirit of inclusion grew out of tragedy, but it doesn’t have to be that way for your community. Need tools for building an inclusive school culture and climate? Look no further than CivilSchools. While I was setting up for a recent bullying prevention presentation at a high school, a counselor expressed disappointment and frustration at some teachers’ reactions to having me come speak to their students. “They don’t understand why we were spending time on an assembly and training like yours when we need to be focusing on achievement.” It’s sadly a common refrain that I hear from teachers around the country. And I get it! Teachers are under tremendous pressure to improve test scores that measure very specific aspects of the student educational experience. More and more, teachers livelihoods are one the line as districts tie teacher pay and teacher advancement to student achievement, a practice that is dubious in its research support to say the least. But this is the environment in which teachers must practice their craft. People are constantly looking over their shoulders, and teachers are under an incredible amount of pressure to ensure growth in their students’ “achievement,” as measured by districts, state tests, and federal measures. Thus, I completely understand the laser-like focus on achievement data. In the most simple of psychology, we know that our basic needs must be met before we can care about more complex problems. As it relates to education, how can a kid focus on the intricacies of balancing equations or diagraming sentences if they are worried for their safety or consumed by their feelings of loneliness within a community that’s supposed to accept and include them? 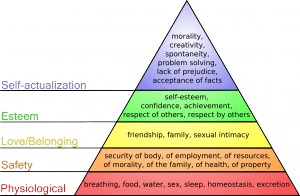 Before students can focus on self actualization and esteem, two of the needs of Maslow’s hierarchy that are met through a rigorous and rewarding education, students have to feel safe and like they belong. Simply put, one of the best ways to improve student achievement is to start by making sure all students feel safe and fully supported in their school environment. Now, when it comes to their classroom environment, most teachers do a pretty good job of meeting this basic need. They make sure that no taunting or teasing takes place during class, and they work hard to support all of their students. However, school culture and climate extends far beyond the reach of one single classroom. That’s precisely why we need school-wide efforts to prevent bullying and to build inclusive school culture. Approximately 30% of students are targeted for bullying behaviors, leading to them feeling unsafe and marginalized within the very community where they ought to feel safest. Further, research from Penn State indicates that those young people who witness bullying are also unlikely to feel safe in their school environment, and the impacts can even last throughout the rest of their lives. Thus, at minimum, 30% of our students aren’t having their basic needs of safety met because they’re being targeted for bullying, and when we consider the students who are adversely impacted by simply witnessing bullying, we know that a strong majority of our young people are carrying the weight of fear into school. Read the rest at CivilSchools.